On Wednesday March 10, 2010, the ABC US Office threw a lunch party in honor of some special guests. A talented group of musicians, called Mingoli, came to the United States as representatives of ABC Malawi's student body. Malawi faculty members Kelly Dehnert and Sam McDonald were also present as well as ABC's President, Paul Chinchen, and a few alumni currently attending Reformed Theological Seminary in Jackson, MS. The combination of cultures, good Southern BBQ, and Christian brotherhood provided a relaxing, festive atmosphere. After several words of introduction, our meal began and in spite of the wonderful food, there was no lull in the conversation. We wish all of you could meet and interact with such fascinating individuals. You can see some pictures on ABC’s website. Downloads Available! This is NOT an April Fool’s joke. A snake bit Sam. I will post pictures later, because I have to put them on my computer first. Don't worry Mrs. Louise, he is all right. We had Perry Jansen come over to look at him and the snake. Sam was walking out the playroom door to go outside and he felt something grab onto his leg and then saw the snake slither outside. He said it felt like a lizard bite him. He came into the living room to tell the girls and me and then went outside to try and kill it. It’s important to kill the snake that bites you so you can find out if it is a poisonous one. Anyway, he found it and it was killed and I called Perry. He told me to bring the snake to him and he would look at it to see if he could tell what kind it was. He was not 100% sure what kind it was, but wanted to take a look at Sam to see if he could see fang marks. So he came over to the house and took a look. On his way over to the house, he made some phone calls and assured us that the US Embassy had the anti-venom if it was needed and there is a private in-patient room at Partners in Hope. Well, it has been about three hours since the bite, and Sam is not feeling any effects, so that is a good sign. Perry said the effects would start the first hour, so I think everything is okay. Please pray though that we will continue to be safe here in Malawi. Not just from snakebites, but from all dangers. To see the latest update on Holli, you can visit her blog. Please continue to pray for her and her family. "I just found out that I tested negative for the breast cancer gene!!!!!!!! So this implies there is no indication that anything could've passed on to my kids! Also eliminates my higher risk for ovarian cancer. Now we need to pray that this cancer is NOT in my lymph nodes!!!!!! My surgery is next Thursday." Please continue to pray for Holli and her family. This is a video of a chameleon eating a grasshopper. During the raining season we find a lot of them around campus. We have had several as pets, but eventually had to let them go so they would live. Malawians are very scared of them. I asked our gardener why he was afraid of a chameleon and he told me they are evil. I think they are unique. You can see when the chameleon ate the grasshopper, a boy in the background kind of jumped back. Well, this is just a little bit of our life here in Malawi. We wish everyone could experience what we are able to experience, so if you would like to visit (or live), just let us know. There is always room for you. Even if you think you don't have anything to offer, there is something for you. Thank you again for all the support and prayers we receive. Check out this link to see some picture of the Mingoli concert at Faith Presbyterian Church in Brookhaven, MS.
We found out this morning that a fellow missionary has breast cancer. Her name is Holli High and she is married to the doctor. She flew back to the States last Wednesday to have things checked out since we don’t have the resources here in Malawi. Her husband, James, and two sons, Chad and Wesley, stayed behind and she was going to return soon with their daughter, Ashley. Well, with this news, James, Chad, and Wesley are heading back to America too. Please pray that they get everything packed, they have an uneventful flight, all their luggage makes it, peace, wisdom for the doctors, etc. We (the family of ABC) met today just to pray for Holli and her family. I couldn’t believe how many people showed up to show their love and support for this family. Chad is (was) in my class and he is a great boy. We will miss having him with his infectious smile and his wonderful heart. He is also a wonderful student. He is always so willing and eager to learn new things and to help other classmates if they need it. Here is a picture of him on Reading Day. He was Robin Hood. Here is another picture of him on International Day. How do you like that USM flag in the background? It was part of my costume. This morning when he got to school he asked if he could talk to me outside. When we got outside he told me about his mom and I told him I had heard and was very sorry. He asked me if he could give his class tickets and homework passes out to everyone in the class since he would not need them. WOW!!!! At a time like this, he is thinking about his classmates and what he can do for them. 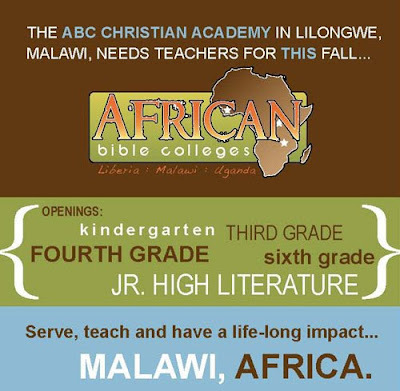 If you want to read about their adventures here in Malawi, you can go to their blog. They are a wonderful family and we will miss them dearly. We love you James, Holli, Chad, Wesley, and Ashley and we will miss you dearly. Here is a picture of the whole family. 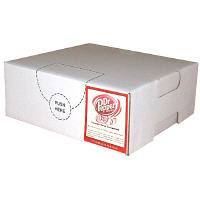 You may remember a while back that I posted about a few of my favorite things and the #1 item was Dr. Pepper. I was wondering how I could get Dr. Pepper to Africa. Well, I found a way. I put Dr. Pepper syrup on the container so all I have to do is mix it with soda water. I was a little skeptical at first, but it really does taste like Dr. Pepper. A lot of people on campus have also been able to enjoy the wonderful taste with us. 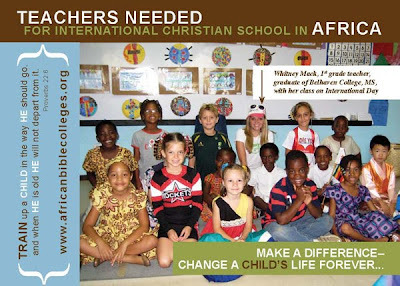 Here is the most recent information on needed teachers at ABC Christian Academy. Please feel free to contact me if you are interested or know someone who is. As you can see, there are a lot of positions that need to be filled for next school year. I will be more than happy to answer (or try to answer) any questions that you may have. So please, please, please get in touch with me.